Eating too much of the wrong thing. We all eat some treats in the festive season, probably more than we should, but be careful not to let your rabbits get to anything that might be toxic to them or too much of what they might like. Chocolate is highly toxic to dogs and in fact is bad for most species including us. For rabbits, the sugars may well be the biggest problem, so as with other treats, keep them away from your rabbits and if you have appropriate treats for them – low carbs, no egg, no dairy – remember, they are still just that, treats, and should only be given in very small amounts. You don’t want to be taking your beloved rabbits to the emergency vet on Christmas afternoon! Company, hustle and bustle – Christmas and New Year are times for families, visitors, people who generally wouldn’t be in contact with your rabbits, and likely not in large numbers. It’s often noisy as well. Remember this can be very confusing and sometimes frightening for your rabbits. They are prey animals, used to you and your immediate family so make a visitor-free zone where your rabbits can feel safe and can keep away from noise and bustle, won’t be handled inappropriately and won’t be fed the wrong things….and cannot escape out of your door when people are coming and going. Owners don’t all follow our social media, not all of them are aware of our website and sadly for whatever reason, aren’t getting proper advice from vets, so we’re asking you to find places to display the poster. Pet shops, vet waiting rooms, libraries, any shop/supermarket that sells rabbit food (ask them to display it beside the food), anywhere else you can think of that rabbit owners might see it, including any online social media you might visit. This important information is being added to all emails. Please disregard if your rabbits have already been vaccinated with both Nobivac Myxo RHD and either Filavac VHD K C + V or else Eravac. There is a mutated strain of RVHD that is deadly, RVHD2. Unvaccinated rabbits don’t stand a chance against it. It is present all over the UK and vaccination against it is vital. Unfortunately the standard Nobivac combined vaccine doesn’t cover it, although that is still essential to protect against Myxomatosis and RVHD1. 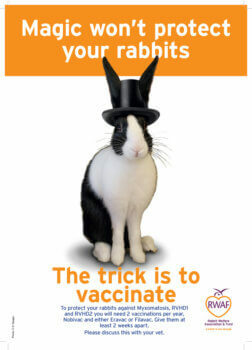 If your rabbits aren’t already vaccinated against it, what you need is either Filavac VHD K C + V or else Eravac. Discuss frequency of vaccination with your vet. The two vaccines (Nobivac and the RVHD2 vaccine) should not be given at the same time, there should be at least 2 weeks between them. If you need to have this done and your vet doesn’t stock the vaccine, there is a map here that shows vets who do. Another tab on the same website shows reported cases, which we know only shows the tip of a very large iceberg, as this disease is very hard to recognise having few to no symptoms at all and so is generally unreported. If you are in the sad position of losing a rabbit unexpectedly please let us know, along with the first part of your postcode so that we can notify the owner of this map http://rhd2map.buntools.org.uk/index.php?&p=cases and also our own social media followers. Another tab on the map site also shows vets who stock vaccine, useful information for us all. Her survey is online and can be found here https://rvc.onlinesurveys.ac.uk/do-rabbits-kept-entirely-indoors-show-more-behavioural-pro Let’s help her with this really interesting topic which will help owners and vets alike better understand even more about the needs of our favourite pets. We’re very happy to see photos and videos from rescue and of those already in their forever homes, where they are finally able to exercise all the typical rabbit behaviours that they haven’t ever been able to previously. Such a very sad start in life for these lovely souls, but a great life for them now, at long last. We inevitably incurred significant bills – some had health problems, all needed to be vaccinated, all the adults neutered, and once the babies are old enough, we’ll be funding their neutering too, so if you haven’t already donated, please do. People have already been very generous and although we haven’t yet had the final bill, we estimate it to be about £3000. Even £1 will help though of course if you can manage more, that would be fantastic – and don’t forget Gift Aid if you pay Income Tax. That will bring us in an extra 25% direct from HMRC, at no cost to you. Some of you have contacted us when you’ve had messages from BT MyDonate to say that our account was closing down. Don’t worry we are still here. As you will know we changed our charitable status fairly recently and we’ve been working hard behind the scenes to update everything with the websites that gather donations for us. While that was an easy process with some websites, it hasn’t always been the case, and the system at MyDonate means that they had to close our existing account and open a new one. Because of data protection MyDonate was not able to give us contact details of all donors and so we weren’t able to inform everybody in advance. Our apologies for not warning you, we simply were not able to. https://mydonate.bt.com/charities/rabbitwelfarefundcio Don’t be confused by the CIO following our name. This was necessary for the transition period between the two accounts but MyDonate assures us those initials will soon be removed. They stand for our new charitable status, Charitable Incorporated Organisation. We were contracted recently by some rabbit owners from Australia. You may know that myxomatosis is rife in Australia and also that there are huge restrictions in some Australian states on keeping rabbits as pets because the Australian government as a whole considers rabbits to be such a pest. Whatever the rights and wrongs of that view the fact remains that pet owners desperately need vaccination to protect their beloved rabbits. We’ve asked you in the past to sign petitions to encourage the Australian government to allow pets myxomatosis vaccine and we’re asking you again now. They have compiled this page to describe the situation and it contains a link to the petition https://www.myxo-vaccine-aus.org We are asking you to sign and to share with family and friends. Of course this kind of operant training wasn’t the only thing covered on the day but it’s certainly grabbed owners’ attention and demonstrated how very useful it can be to train your rabbits to perform specific tasks. As always if you have moved house and forgotten to tell us please email hq@rabbitwelfare.co.uk with your up to date details. The next issue of Rabbiting On is well on its way to being completed so if you want to receive it on time we need to have your address. Please also ensure that your subscription is up to date. If you subscribed online it should automatically renew. As usual you can expect the new issue to land on your doormat in early August. 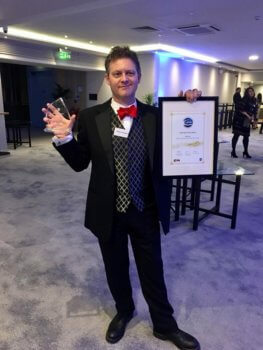 And finally just in case anybody missed it we want to congratulate our wonderful Specialist Veterinary Adviser Richard Saunders once again for having been awarded the CEVA Vet Of The Year. As you can imagine we all had smiles splitting our faces when he won https://rabbitwelfare.co.uk/richard-recognised-for-welfare-work/ How richly this was deserved. All UK rabbit owners owe Richard a huge debt of thanks for his amazing work getting RVHD2 vaccine into the UK and his ongoing commitment to rabbit welfare.